You’re going to hate me for this. 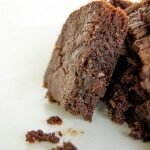 I even thought twice about posting this recipe, but Nutella Brownies, in less than 30 minutes, made with only 4 ingredients… If you’re still there, at least read through the recipe before running off to the kitchen! 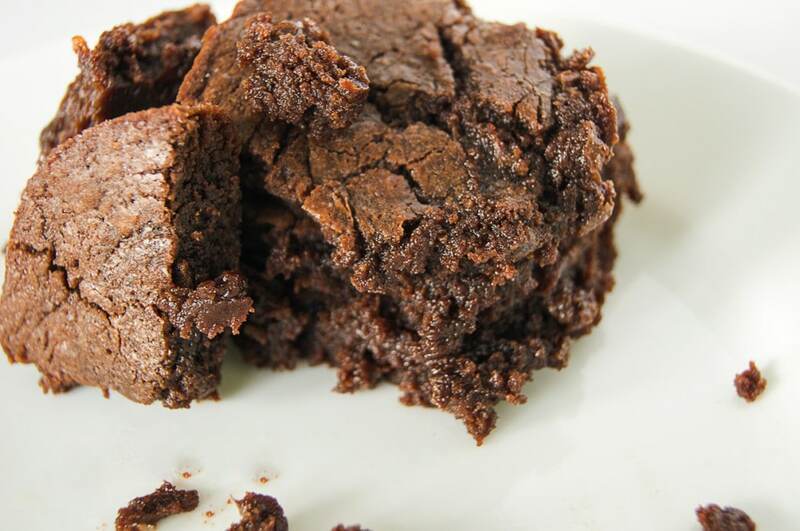 I’ll keep this one short – I know the moment you read ‘Gooey Nutella Brownies’ you made a move towards the kitchen. I understand, and I support you wholeheartedly in your decision. Allow me to humbly present you with an ingredients list, and some cooking directions so your Nutella Brownies are the best Nutella Brownies they can be (though let’s be honest, even if they were overcooked, you’d end up with what is essentially a delicious Nutella close-enough-to-a-cookie-thing). How does this work with such few ingredients? Well, in brief – Nutella is magical (it also already contains chocolate, fats, and sugar!). Now – in the off-chance that you don’t have any Nutella, this recipe will work with any chocolate hazelnut spread, though the flavour/consistency may be slightly different. And if for whatever reason, chocolate hazelnut spreads aren’t your thing (WHY THE DEVIL NOT?!? )… you should still make some good ol’ fashioned Chocolate Chip Brownies today. Go eat! And be merry! But before you do, be sure to follow me on Facebook, Pinterest, and Twitter. That way we can keep in touch and be besties! Don’t you want us to be besties? BFFs? Compadres? Amigos? Buddies? Pals? Of course you do! And comment below. Because I like hearing from you, bestie. Recipe for Nutella Brownies. Made with 4 ingredients. Made in less than 30 minutes! What are you waiting for? Pre-heat oven to 350 degrees F. Butter your baking tray (a 9-inch tray works best for me). Pour your combined batter into the tray. Smooth. Bake for 15-25 minutes or until a toothpick inserted comes out clean. 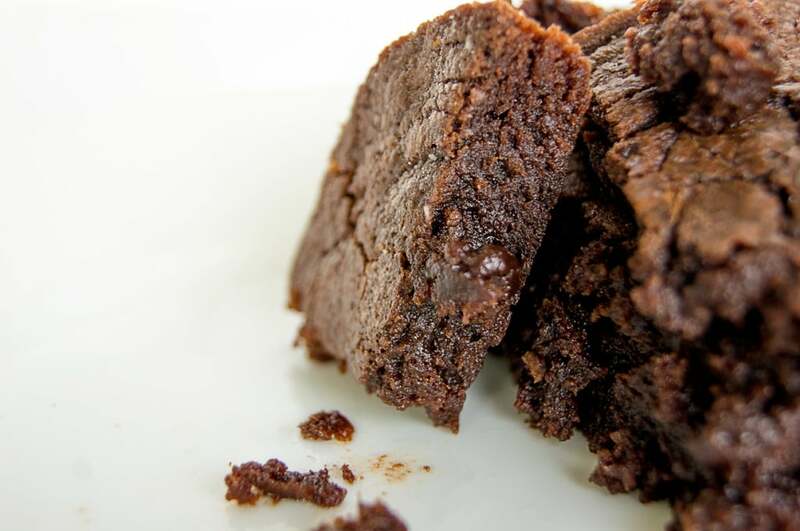 The optional ½ tsp Baking Powder will result in a fluffier, more cake-like brownie. I’ve updated it in the recipe itself as well. Hope you enjoy it! They sound so easy and look AMAZING! I’ll have to grab some Nutella and get going! They are INCREDIBLY easy to make! I hope you like them Jenna! Hahaha! Hope you enjoy them Sarah! Your recipe turned out the best that I ever made! We are not computer people, but I got an i phone and have internet on it. Your site was the easiest to read, and you have the best photos. I collect recipe books, and really like it when there is a good photo. We also just made your fluffy pancakes, and they are our new favourites (and I am usually a banana crepe person) . Thank you for the work & effort you put out to share with everyone. Hi Gaylene! Thank you so much for your lovely message! 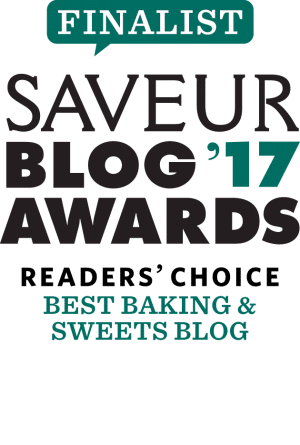 I can’t really express how happy it makes me that you found my site easy to read, and that my recipes turned out well for you – I do put a lot of myself into building the site and writing each recipe, and your comment has just made me very, very, happy! Hi sir riz! how many brownie squares did u produce out of this recipe? is it really fudgy and gooey in the inside? thank you so much! Hey there Lucille! The number of brownie squares will depend on the size of your baking dish, and the size you like to cut your squares! I think I usually get around 20 pieces with a 9-inch square baking dish. Hope you enjoy them! Everyone I know that’s tried them has asked for the recipe! Only 4 ingredients? Sign me up for a batch! Haha! Okay, making a batch just for you! Can’t wait to try this! I bought 2 large containers of nutella from costco (very greedy) and this is an awesome recipe to use some of that up. Ah! Yes! I hope you like it… this is actually the recipe that a lot of my personal friends have chosen to make! And everyone has loved it so far!